Again, we would like to Thank our Awesome Jaded Blossom Fans, our Amazing Design Team and our Guest Designers. Just in case you didn't know we also have a Facebook Jaded Blosson's Garden of Creativity where our fans share their creations with one another so join up and get inspired. and of course be a follower of our Blog. This will be a our Designer Abby's last day with us :( so sad, she has been with us for such a long time and not only was she an Amazing Designer but she is a Great Friend. Although we will miss her so much and wish her nothing but the very best, especially in her business Dilo eñ Espanol. Congratulations Ladies and we look forward to working with each and every one of you. Here is our Awesome Limited Edition Kit for Sale. Stamp Sets will NOT be sold individually until sometime next year and Jewel color will vary. Leave a comment on each blog and of course let us all wish Jaded Blossom a Very Happy Birthday! Congrats to your new design team!! And to all the guest designers!! Can't wait to see all of the new inspiration! Best of luck to Abby & Kim!! What a fabulous line up of designers you have! Congrats to you and your wonderful team. 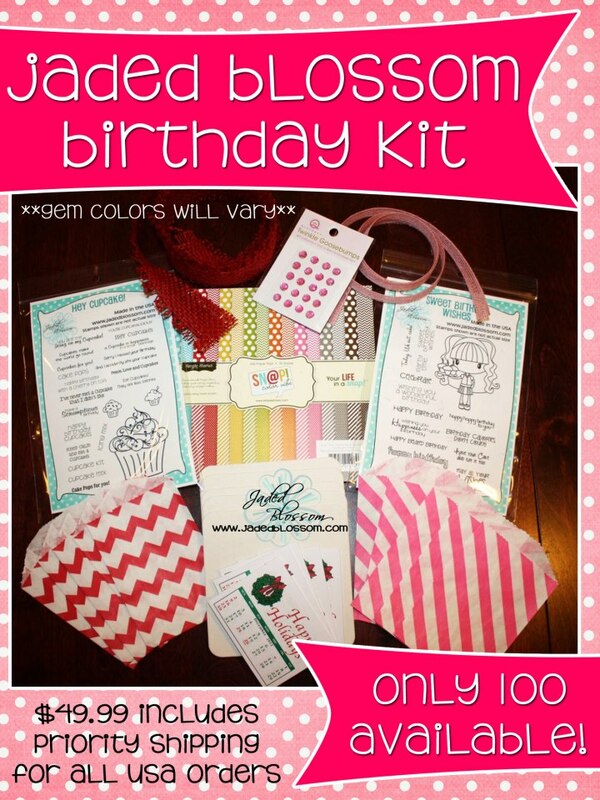 Just placed my order for the Birthday Kit and now I'm off to blog hop - Happy Birthday! What an awesome hop!! A great Birthday kit!! Happy Birthday!! I am super excited about being a Guest Designer!! Happy 1st birthday! The blog hop was fabulous! Happy First Bithday!!! And congrats to everyone!! Can't wait for my month!!! Happy Birthday, Jaded Blossom! And congrats to the new team members. Sorry to see the old team members go, but i'm stalking their blogs so will see their creations there. Great hop! Thanks for sharing. Happy Birthday to you! So happy to have found you're terrific stamps and dies. Happy customer. Cheers! Thank you sooo much for the GD spot!! I'm so excited. Love Jaded Blossom!! I'll miss your designs Abby but congrats to all the new design team members! Happy 1st bday JB!! And congrats to all the DT members!! Happy Birthday JB ordered the birthday kit can't wait to receive it!! Happy happy Birthday !! Congrats to all the new design team members old and new !!! Happy Birthday! I got the kit and I can't wait to play with it! Happy birthday and can't wait to see what the new designers come up with. Congrats to all!! So sad to see a couple great designers go...happy for all the new designers. Welcome aboard....and of course congratulations and Happy Birthday!!! All the stamps are fantastic and it has been great fun seeing your DT use them. SORRy. Happy 1st and a huge Congrats! Happy Birthday Thanks for the chance to win. These new sets are amazing. I love the cupcake set! Happy birthday to JB!!!! and big congrats to the new DT members! This is so cute. Can't wait to get my hands on it. Happy Birthday to Jaded Blossom! This is such a cute set!! Happy Birthday Jaded Blossom!! Congrats on 1 year and here is to many many more awesome years ahead!!! Happy Birthday Jaded Blossom! So excited and honored to be on the team. Congrats to the rest of the new ladies and guest designers.